Zul, Reborn is a boss in the Uldir raid in World of Warcraft. Our strategy guide will help you to defeat the Zul, Reborn encounter and the loot listing below contains all of the loot he drops on each difficulty. Zul, Reborn is a two phased encounter, where the first phase consists of add management, while the second phase is a soft enrage. Dark Revelation targets two players each time it is cast, rather than just one. Pool of Darkness will spawn in both phases, instead of just the second one. Nazmani Bloodhexers have a Sanguine Presence which causes them to heal nearby adds if they come within 20 yards of another Nazmani Bloodhexer. The boss and adds should be fought around the center of the room to make cleaving damage more efficient. Nazmani Bloodhexers that spawn around the edges should be gripped close to the center by a Death Knight. On Heroic, only one Hexer at a time should be gripped in. Dark Revelation debuffs should be positioned on the same edge of the platform, but a safe distance from each other. Nazmani Bloodhexers are the highest priority targets, and should be killed quicky before they reach full energy. If Bloodhexer is close to full energy it should be moved away from the boss. Ranged DPS or healers should cover Pool of Darkness on Heroic. Minions of Zul should be quickly dispelled to prevent them from reaching their targets. Arcane torrent can also be used. Nazmani Crushers should be tanked close to the boss to allow for damage cleaving. If the Crusher is close to full energy it should be moved to the edge of the platform to minimize the targets hit by its cast. 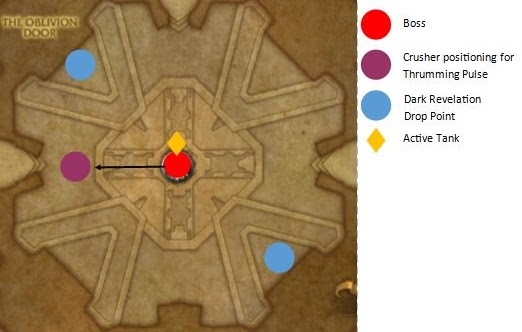 This is a short burn phase, where players should stack close to the boss to make raid healing easier. Pools of Darkness should be soaked by ranged DPS. Only one player per pool is required. Players affected by Deathwish should be dispelled when close to the edge, to reduce the damage to the raid. Avoid standing in front of Nazmani Bloodhexers, or the boss in Phase 2. Prevent Minions of Zul from reaching their targets. They will deal damage and fear nearby players. General target priority is the following: Nazmani Bloodhexer > Bloothristy Crawg > Nazmani Crusher > Boss. This priority can change if one of the adds is near death and about to reach full energy. All adds have a special they cast when reaching full energy, making it important to kill them quickly. The Nazmani Bloodhexers will summon an Animated Ichor when reaching full energy, which becomes the highest priority target. This add can be knocked away from the boss to prevent it from reaching. Shadow Barrage will be cast on random players. This dot will put these players at high risk in combination with other mechanics. Large bursts of raid damage will happen each time a Dark Revelation buff times out. Players soaking the Pool of Darkness will take a significant amount of damage. Phase 2 will have a large amount of raid damage, depending on the stacks of Corrupted Blood on the raid. Players with Deathwish should be dispelled when near the edge of the platform. The boss does not require tanking, so the tanks will have to split the responsibility of picking up the adds that spawn. Crawgs can be tanked on top of the highest priority target, and they will die to cleave damage. Nazmani Bloodhexers, and Nazmani Crushers can be tanked close to the boss, however they must be moved to the edge of the platform when they near full energy. In Phase 2 tanks will take turns holding aggro and standing in front of the boss. Taunt swap after a few stacks of Rupturing Blood, and run the debuff to the edge of the platform before it times out. Stepping in a Blood Pool will apply additional stacks, so they should be placed near each other to maximize the available area. Created by Crzypck, officer and Raid Leader of Mist on Area 52. This guide is geared towards Heroic and Mythic, with no details about Normal difficulty. If you have any questions, please feel free to ask! Crzypck can be reached here on MMO-C, or on Discord at Crzypck#6309. If you find this guide helpful, feel free to throw him a follow on Twitch. Also, special thanks to Limit, the World #2 and NA #1 guild, and specifically Tagzz for consulting on the Mythic strategies! Phase 1 is an add phase. Phase 2 is a burn phase. Zul casts this at a random target. It cannot be avoided and needs to be healed through. It does 40k damage on the initial hit, plus 12k damage every 2 seconds for 10 seconds after. Pool of Darkness - small purple circles appear on the ground. These puddles last 20 seconds and spawn throughout the entire encounter. They must be soaked by a player. If nobody is soaking the puddle, it deals 18k damage to the raid per second. Each puddle must be soaked by 1 player. The person standing in the puddle takes 25k damage every 2 seconds. The puddles spawn randomly throughout the room. This is a 10 second debuff on two targets. It deals 60k damage to the raid when it expires, reduced by your distances away from the debuffed player. Upon detonating, 5 Minions of Zul spawn. These fixate on random players. If they reach target they instantly AoE fear within 5 yards. The fear lasts for 12 seconds. They have an absorb shield called Bound By Shadow, which absorbs 120k damage. If the shield is broken or dispelled, the minion will die. Mass Dispel can immediately kill an entire group of 5 minions. The Blood Elf racial can also immediately kill an entire group of 5 minions. All other single target dispels will work on individual minions. Dark Revelation occurs every 50 seconds, starting about 35 seconds into fight. If you don’t have 2 priests, you’ll need to have other players on dispell duty. Mages should not spellsteal these adds, as it places the same 120k absorb shield on the mage, instantly killing the mage when it it is removed. These large adds do a frontal cone cleave and need to be tanked facing away from raid. This shout increases damage done by Zul & all other adds within 30 yards by 50%. The add will cast it once the Crusher reaches full energy. To avoid this empowerment, move this add 30+ yards from the boss and adds at ~85% energy, moving back in once the cast completes. The Bloodhexer will cast BloodShard which is an interruptable cast that deals 45k damage to the player with the lowest HP in the raid. It should always be interrupted. At full energy, the Bloodhexer will cast Congeal Blood, which spawns an add that will move towards the boss. If it reaches boss, it heals Zul for its remaining HP pool. This add can be crowd controlled with stuns, slows and knockbacks. Congeal Blood is cast roughly every 20 seconds if a Bloodhexer is left alive at full energy. If 2 Bloodhexers are within 20 yards of each other, they heal all other NPCs for 10% HP every 2 seconds. This is a wipe if it occurs. Bloodhexers spawn roughly every 55 seconds in pairs of 2. They can be crowd controlled by all humanoid based crowd control including Polymorph, Freeze Trap, etc. One Bloodhexer should always be CC'ed where it spawned, while the other is killed. 4 Crawg adds spawn periodically. They heal themselves for double the amount of melee damage they perform. Upon reaching full energy, they AoE the raid for 60k damage every 2 seconds for 10 seconds. This is a wipe mechanic. These must die before reaching full energy. 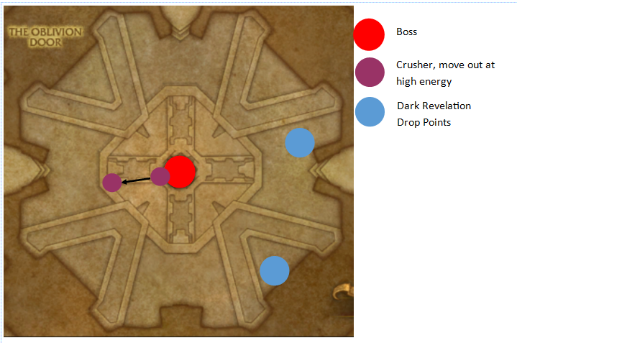 Create assignments for Dark Revelation locations and dispells. Players who get the debuff must move far away from the raid to reduce the damage done. Immediately after the AoE goes off, dispels need to happen to kill adds. The encounter begins with 4 Crawgs, 1 Bloodhexer, and 1 Crusher. Zul does not need to be tanked in phase 1. One tank will tank the Crusher and help on Crawgs as needed. Always tank the Crusher facing away from the raid. When the Crusher is ~85 energy, move 30+ yards from Zul and any adds. The other tank picks up a Bloodhexer and the Crawgs. When the Bloodhexer is about to cast Congeal Blood, move it away from the boss. While the Congeal Blood cast can not be kicked, you can stun the Bloodhexer to interrupt the cast. With fast DPS, a Bloodhexer should never get get a Congeal Blood cast off. If it does complete a Congeal Blood cast, DPS should focus down the add that spawns immediately, using crwod control to slow it down. When Bloodhexers spawn, you must have someone immediately crowd control one, and grip the other Bloodhexer into melee range. Kill one Bloodhexer immedaitely then grip the second Hexer into raid. Note that the Bloodhexer still continues to gain energy while crowd controlled. This means it will be near full energy once you finish the first Bloodhexer. When the second Bloodhexer is brought into melee, it will attempt to cast Congeal Blood. Stun the mob the moment it starts casting. Depending on your DPS, it may attempt to cast 2-3 times before you kill it. Ensure it gets stunned every cast. The ideal time to push out of Phase 1 (40% HP on boss) is under 2 minutes and 52 seconds. This prevents a third set of Hexers from spawning. It is recommend having all of the DPS be talented for maximum single target damage. This encounter requires you to push the boss to 40% in a timely manner. Everyone must be aware of Pools of Darkness, and help soak as needed. This cheese strategy requires decently high raid dps. Pre-potion and Bloodlust on pull. Nuke down all the adds that the boss starts with, then turn and DPS Zul as hard as possible. At 0:55 seconds, when the first set of Bloodhexers comes out, CC both Hexers, ignore them, and continue hitting the boss. These two Hexers need to be kept crowd controlled the entire encounter. When the Crusher spawns, everyone switches to kill it immediately, then the raid focuses back on the boss. Your goal is to push out of phase 1 before 1 minute 55 seconds when the second group of Hexers spawn. Pool of Darkness - still happen, the same as in the previous phase. This debuffs 2 players, making them lose control and walk towards the edge of platform, ultimately jumping off the ledge. Upon either the player jumping off, or the debuff being dispelled, the raid takes ~42k damage, reduced by distance. This also spawns 5 Minions of Zul in the same manner as Dark Revelations in phase 1. The priest ability Leap of Faith can be used on these players. This applies Corrupted Blood to the entire raid, 1 stack per 5 energy consumed. The longer phase 1 took, the more energy the boss will have, resulting in more stacks on the entire raid. Corrupted Blood deals 500 damage per 2 seconds for the rest of the fight, per stack. The cast of Locus of Corruption can be negated by certain classes with skills that make spells "miss" them, such as Hunters with Aspect of the Turtle and Rogues with Cloak of Shadows. This will prevent them from receiving any stacks of Corrupted Blood on the transition at 40%. If a player assigned to soak a Pool of Darkness in phase 2, they should save their immunity / survivability cooldown for that moment. This is a debuff applied to targets in a frontal cone of Zul that stacks. It does 21k damage every 2 seconds for 20s. Tanks must swap at 3 stacks or fewer. Upon expiration, the debuff leaves a giant pool of corrupted blood on the ground. Anyone in the pool gets a Corrupted Blood stacks. Pools of Darkness can be handled just like in phase 1. Healers need to be ready for Deathwish. Assign main dispellers + backups and dispel as late as possible without letting the players jump off the edge. If you have priest healers, use Leap of Faith on one player once per Deathwish to spread out the timing of the explosions. Tanks must drop their debuff at the edge of the room, ideally near an existing pool. The tank swap should occur at 3 stacks. Healers will have to pay special attention to the tank as they move out to let their debuff expire. It is recommended that you set up a cooldown rotation as this tank will still take a lot of damage from the DoT. If you have any Paladins in the raid, you can use Blessing of Protection to instantly remove the tank debuff. This still triggers the pool of blood, but allows you to use a slightly alternative strategy of having a tank receive higher stack (4-5) then quickly move out to the edge of the room, receive a Blessing of Protection, then rejoin the fight. As more and more of the room is covered by Rupturing Blood pools, the raid may need to reposition itself closer to a clean side for Deathwish. If you did not Bloodlust in phase 1, you should do so immediately in phase 2 as this is the burn phase. Kill the boss before you run out of room. The person soaking the pool now gets 1 stack of Corrupted Blood every time they take damage from soaking. If the pool goes unsoaked, the entire raid gets 1 stack of Corrupted Blood per tick of the AoE damage, stacking. Each pool will apply a total of 10 stacks of Corrupted Blood from the time it starts to the time it despawns. It is recommended to rotate players into the pools when the previous soaker reaches 5 stacks, which is halfway through the duration of that pool. This is a debuff that is applied randomly to one of the adds at the start of the fight. If this debuff is not present on an add, and that add dies, it will respawn after a few seconds. The debuff lasts for 12 seconds. Upon expiration, it jumps to a random add of a different type. You can dispell the debuff to force it to jump to another add. Ensure the debuff is present on priority targets such as Bloodhexers and Crushers before they die. It is not important for it to be on Crawgs. There are Weakauras that will show the debuff on enemy health bars via v-targeting to make tracking easier. The add affected with the debuff also grows in size and glows a greenish color. All phase 2 stays mostly the same, other than the fact that there will be many Crawgs up for the whole encounter, due to them respawning. A clean and well executed phase 1 is required to have a succesful chance in phase 2. Subtley Rogues are incredibly powerful on this fight. They can spam their AoE combo point builder on the Crawgs, and dump 5 point eviscerates into Zul every other global. While not required, bringing 3-4 (or more) Subtley Rogues makes the encounter much, much easier. While the fight has been killed with two and fewer rogues, this guide strategy assumes you have access to several. If you opt to stack rogues, your objective is to Bloodlust on the pull, kill the one Bloodhexer that is up at the start quickly (ensure you dispell the debuff to it so it does not respawn) and focus down Zul. The Crawgs are purely there for the rogues to build combo points and should not be AoEd by other classes. Crawgs should only be killed when they are reaching high energy to prevent them from AoEing, they will respawn shortly after. The Crusher will get low naturally from cleave and must be killed before the second Crusher spawns. If successful with this strategy, you can crowd control the 1st set of Bloodhexers that spawn, and push the boss to 40% before the second set spawns. This makes the encounter significantly easier as you never have to deal with any Bloodhexers beyond the one that starts out with the fight. Eventually, the Crawgs become dangerous due to the number of them that are alive, and they can easily kill a tank. It is recommend to bring 3 tanks to this fight. One tank will be responsible for kiting Crawgs around Zul so the rogues can AoE them, while the other tanks will handle the tank swap mechanics. Thanks to Limit for the Mythic kill video! Overview - Zul begins the encounter assisted by the Forces of Blood. He will continue to summon additional Forces of Blood that the party must contend with while his energy fills. At 40% health, Zul no longer summons the Forces of Blood and becomes fully empowered with the Blood of G'huun, unleashing Locus of Corruption, spending his Elder Blood to afflict the raid with Corrupted Blood for the remainder of the encounter. Players must defeat him before the damage from Corrupted Blood overwhelms them. Once Zul casts Locus of Corruption, the group will begin taking constrant damage for the remainder of the encounter. Stage One: The Forces of Blood - Zul summons the Forces of Blood to defend him as he gradually builds energy over the course of Stage One. Pool of Darkness - Creates a Pool of Darkness at a location for 20 sec. Periodically, the Pool of Darkness will explode in Erupting Darkness, unless a player is standing inside of it. Players standing in a Pool of Darkness are afflicted with Absorbed in Darkness. Absorbed in Darkness - Standing within a Pool of Darkness inflicts 20 Shadow damage every 2 sec. Erupting Darkness - Inflicts 20 Shadow damage to players within 45 yards. Dark Revelation - Unleashes a Dark Revelation after 10 sec, dealing 49 Shadow damage to all players. This damage decreases with distance from the affected player. Additionally, a Minion of Zul is created near the player's location. Minion of Zul - Minions of Zul fixate on players and cannot be tanked. Bound by Shadow - Absorbs 100 damage and increases damage done by 20%. Kills the target when removed. Pit of Despair - When a Minion of Zul reaches its target, it causes a wave of terror, making players within 5 yards run in fear for 12 sec. Shadow Barrage - Inflicts 33 Shadow damage to a random player. Call of Blood - Zul forms allies out of the blood he has been gifted by G'huun, summoning the Forces of Blood. Blood Recall - When killed, the Forces of Blood will regenerate after a short period unless afflicted by Decaying Flesh. Decaying Flesh - The instability of G'huun's blood magic suppresses Blood Recall for 12 sec, allowing the afflicted creature to be killed without regenerating. When removed, will jump to another creature of a different type. Bloody Cleave - Inflicts 0 Physical damage in a cone in front of the caster. Thrumming Pulse - Increases the damage done by Zul and his minions within 0 yards by 50% for 40 sec. This effect stacks. Congeal Blood - Congeals the ambient blood of G'huun into an Animated Ichor at the Bloodhexer's location. Animated Ichor - Animated Ichors attempt to move to Zul. Upon reaching Zul, they will cast Ichor Transfusion. Dripping Blood - Animated Ichor loses 1% health every 0.5 sec. Ichor Transfusion - Transfers all of the Animated Ichor's current health to Zul, and instantly kills the Animated Ichor. Bloodshard - Inflicts 37 Shadow damage to the lowest health player. Sanguine Presence - If two Nazmani Bloodhexers come within 20 yards of each other, their Sanguine Presence will burst, healing all enemies for 10% every 2 sec. Hungering Maw - Whenever a Bloodthirsty Crawg deals damage, they heal for 200% of the damage dealt. Engorged Burst - The Crawg ruptures, killing it and inflicting 20 Shadow damage to all players every 2 sec. for 10 sec. Stage Two: Zul, Awakened - At 40% health, Zul unleashes the energy built over Stage One by casting Locus of Corruption. Locus of Corruption - Zul consumes all of his energy, applying one stack of Corrupted Blood to all players per 5 energy consumed. Corrupted Blood - Inflicts 0 Shadow damage every 2 sec. This effect stacks and lasts until the end of the encounter. Rupturing Blood - Afflicts targets in a cone in front of Zul with Rupturing Blood, dealing 18 Physical damage every 2 sec. for 20 sec, and creating a pool of Ruptured Blood upon expiration. Ruptured Blood - Creates a large pool of blood that periodically applies Corrupted Blood to any players inside it. Deathwish - Fills a player with a Deathwish, causing them to walk towards the edge of the arena and jump off the platform to their death upon reaching it. When the player jumps, or when Deathwish is dispelled, Deathwish inflicts 35 Shadow damage to all players. This damage is reduced by range. In addition, several Minions of Zul are created. EdgelordsDefeat Zul, Reborn in Uldir without any player stepping onto the inner ring of the Oblivion Door on Normal difficulty or higher. Mythic: ZulDefeat Zul in Uldir on Mythic difficulty. Zul, Reborn drops item level 340 (LFR), 355 (Normal), 370 (Heroic), 385 (Mythic) loot. Loot can have higher item levels if it becomes Titanforged or Warforged.